There are not many players that bring about different opinions as much as Theo. Alex Song was a closer second in my opinion but I have always had ‘debates’ about Theo Walcott. 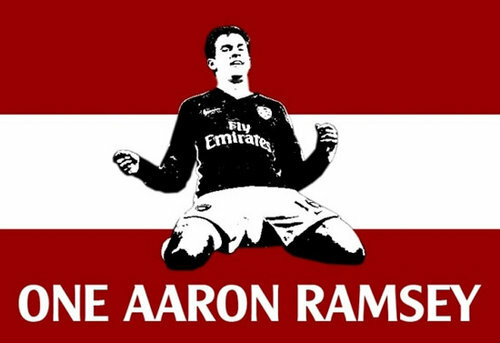 From feeling very uncomfortable in the first half of that Spurs game while listening to the groans for every miss placed pass to the whole ground singing his name after scoring two important goals to make the game safe for Arsenal, I have always been an admirer. I will be up front about this; I want and hope Theo Walcott will stay. At 23 years old, he has two big contracts left in his career. He is not 26 plus and does not have to go out and get the highest wage he can just yet (hopefully he never will). 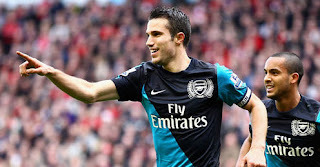 He has developed in my opinion at Arsenal and his statistics show this. He has been inconsistent but last season, I felt he improved and got a proper season without injury under his belt. Is 75k a week a fair deal? I think it is. But the trouble with football is, what we think is a fair deal, others may not and even if they do, they still have the resources to pay a lot more and not even blink. I love the line about Arsene Wenger being the sane one but living in a crazy world rather then the other way round. I believe this to be true but as a club, losing players will happen more and more with the wages in this crazy world paid by other clubs. Theo, unlike Robin, has a re-sellable value; that means, paying him a bit more now but being able to sell him for the same value or more (unless his forms dips dramatically) is an option. I’m not sure if I would pay him much more but if it’s the question of 5k maybe 10k or so, I would consider it because at 23, he has the potential to improve and if he does not, I am still convinced there would be a club that would take a punt on him in a few years. Regardless, he certainly has not gone yet and I remain hopefully he will re-sign because as I have mentioned many times, I rate him; plus I would have to change my twitter display picture which is just too much effort! Robin Van Persie - Sell or keep? From speculation at the end of the season, to a meeting in Totteridge which led to a statement after the Euro’s to Mr Ferguson moaning about how Arsenal are dealing with their own player. The saga has dragged on and on. 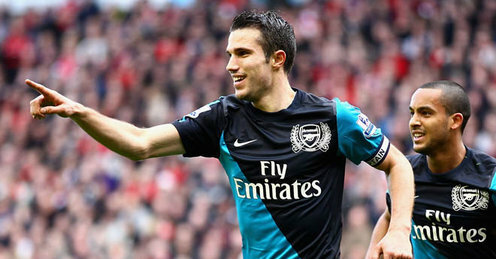 Where will Robin Van Persie end up? No sod knows in reality. Juventus have a few issues with their manager being banned for some sort of corruption; Man City has never been high up in preferences for Robin according to most and notably his own father and Arsenal do not seem to keen to sell to Manchester United. Arsene Wenger has NEVER sold a player to Manchester United and you get the feeling he wants to keep it that way. I wrote earlier in the summer (shortly after the statement was public) that I would want Robin Van Persie sold sooner rather then later and I still feel that way BUT selling to Manchester United, a team that we have been in such rivalry with would hurt the supporters. We all remember the battle of Old Trafford, Pizza gate and the infamous tunnel incident when Roy Keane and Patrick Vieira had a ‘heated’ debate regarding Gary Neville and Jose Antonio Reyes. 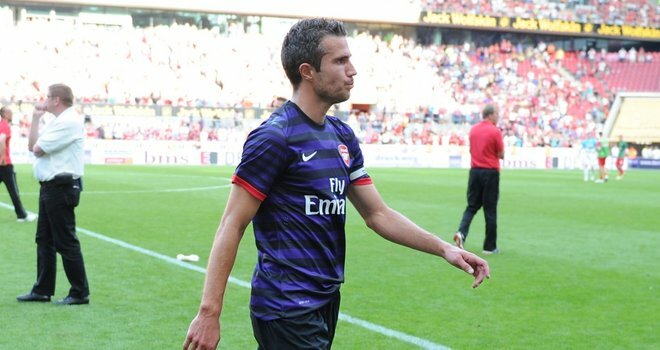 I wrote this summer but how keeping Robin after the statement has the potential to damage the morale that Arsene Wenger has worked so hard to maintain. I was concerned that Robin may start talking to others and just sulk his way to a move like others have done. But hearing bits and bobs from journalists and the media men internally at the club along with a few others, everyone is in agreement that Robin has been focused, has trained hard and has even been enjoying himself since he has returned to training and has been impressed with the new players that have come in. Putting my bitter feelings aside (I just do not like people that disrespect the club I love) and thinking about what is best for Arsenal football club may mean keeping Robin. Apart from going to Juventus, there is no real benefit of selling on the cheap to the Manchester clubs. Off course, he could go to Utd and break down and be out for seven months but if we are counting on that, we really do need to get out more! Selling him to Manchester United can only have a negative impact on Arsenal you would think; you just do NOT want to strengthen a rival, especially a rival that you could compete with if results go your way. If Robin is committed (even for a year) and is focused and plays well then keeping him can only be good for Arsenal football club. He may have to go through a phrase of ‘winning the supporters back’ but it was him who put out a statement, badly advised or not, that criticised the club, the manager and the new signings. If Robin’s statement was true and he is worried about the lack of direction then come December or January, if the new signings have settled down and Carzorla in particular has started well and Arsenal are in the hunt for top honours, then surely Arsenal have a chance of re-negotiating with Robin Van Persie and the chances of him signing a deal ‘should’ increase. It’s certainly a tough call for Arsenal and having another manager moan about the way Arsenal are handling the transfer for their best player and captain who IS under contract does not help the cause but Arsenal seem different this summer, they seem like they are not going to let others dictate or bully them into selling someone at a lower price then what they have set and may just take the chance by keeping Robin, unless a bid they cannot refuse comes in, i.e 20m plus. Whatever happens, the summer has been a positive one with Podolski, Giroud and Cazorla coming in and perhaps one or two more still to come in, so regardless of what happens with Robin Van Persie, I am quietly confident that this could be a season to remember for Arsenal football club. A Disrespectful Statement? I Thought You Loved This Club Robin? Van Persie @ PFA Awards – he made no eye contact at any cameras; he stuttered his words when giving his acceptance speech and paying tribute to his team mates (the same ones who are now not good enough to win trophies). He ended by saying he will speak to Mr Wenger about “two things and it’s nothing special” – what ever that means! 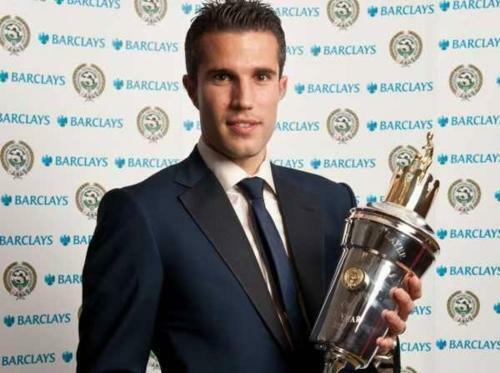 Van Persie @ PFA Writers Awards – “Arsenal is an unbelievable club. I am the player I am today because of them. I’ll set a date to see the boss and Ivan Gazidis. We haven't set a date but we will be having a meeting about my future and lots of other things.” And when asked on new signing Podolski he said he was a ‘great signing’ – oh how that has changed! Van Persie at West Brom Away –‘I love this club. Whatever happens that will never change," Yeah we know why you said that now! I am all for showing ambition and direction, and buying star names may mean a better chance of silverware; so let’s go and buy Wesley Sneijder and Arjen Robben and win the league. Would you like that Robin? I would have thought the Euro’s showed Robin that having big names does not guarantee anything. Watching Robin and Holland this summer made me appreciate the team morale and spirit at our club because last season was as good as I have ever seen it in a long while. I thought Robin would have appreciated that too. Now to that statement; that stupid statement. If a good player wants to increase his chances of winning silverware, that’s fair enough. I accepted Cesc and Samir going even though I did not like it! I have never given Samir Nasri any credit but at least he kept his mouth shut and let Arsenal get the best possible price for him. Robin, on the other hand, has decreased his value and Arsenal’s bargaining power completely by releasing such a stupid statement. For someone who proclaims to love the club and have ‘great respect’ for Mr Wenger, he has a funny way of showing it. He has criticised his team mates by hinting they are not good enough and clearly does not think much of Podolski or Giroud by slamming the ambition of the club. For me, it’s all about getting rid of him as soon as possible before he starts being a disruptive influence. Remaining as captain and gaining the respect of his team mates will now be an impossible task. In Robin, we lose an amazing player and one who was brilliant last season, but let’s not forget the other six and a half. I find the statement even more baffling because of the way Mr Wenger and the club stood by him during his darker days (i.e. injuries, getting arrested, low moments with the national team etc). The manager has made many mistakes, like all managers do, but the faith he has and belief he has over his players and the way he stands by them is one of his best assets, and Robin has thrown it back in his face. I will never forget Chelsea and Liverpool away this season and Robin made it happen and for that I am grateful but for all the respect I showed him, I expected some back. Enjoy your life Robin because in my opinion, you have burnt your bridges here. So we all saw it, a certain Mr Arshavin ran the show on Friday night and many Arsenal supporters were wondering where this little Russian has been for the last year or so. I have always been keen to keep faith with Andrey Arshavin but something clearly was not right last season. Perhaps his loan spell has just recreated that form we saw when we bought him. I find myself having real issues and creating bonds with players and wanting to believe that they will come good and that has caused me a lot of heartache at times but with Arshavin, it may be worth the risk? It will be an interesting summer, if he has a good tournament overall, would it be silly to get rid of him? We saw our keeper not exactly get off to the best start, we saw our new front man miss a sitter and saw our big German defender back named as a sub in the space of a few days. Today we may see Alex Oxlade Chamberlain start for England and many have asked the question, what does this mean for Theo Walcott? I think Theo Walcott had a very good season and his goals and assists record speak for it itself however, I think playing Chamberlain tonight may be a fantastic move. Without Rooney, England will have to try and make the most of the ball when they get it against a very good France team (on paper anyway) and perhaps Chamberlain is in a better position to do this. I would have loved Theo and Chamberlain to start together but I can understand why Milner will/is chosen (I cannot say the same about Downing though!). I think Theo has a big part to play tonight and in the rest of the tournament and think the 6/1 odds of Theo scoring tonight at any time or 14/1 to get the last goal (even as a sub) is well worth a punt! For once, England does not expect, and that is not a bad thing. 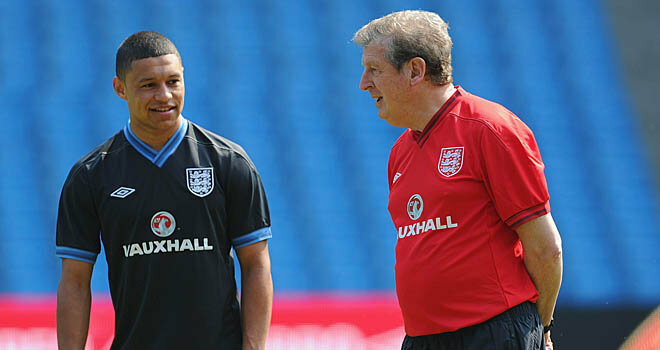 Come on England and off course, come on Chamberlain and Theo! So,it's all come down to the last game, and it could even be the last minute or last second; after all, we are the Arsenal! It’s been one hell of a strange season. For the first time in a while,Arsenal have not been competitive in the League or any of the cup competitions - during the last seven years, we've usually been more competitive in the title race or progressed through to the latter stages of a cup competition. But this season, with one game to go, third is the best we can hope for. I think Arsenal have achieved some significantly positive things this season. Mikel Arteta has been fantastic. Laurent Koscielny and Thomas Vermaelen have complimented each other well, with the latter signing a new long term contract. Tomas Rosicky has paid back a lot of the faith shown by the club and manager by putting in some brilliant performances and winning the player of the month award in consecutive months. Of course, we cannot forgot our horrendous start to the season and the disaster of a summer that preceded it. Indeed even the manager admitted to it. But to come back so strongly after our abysmal start shows the team has developed the sort of steely backbone and determination that our critics have openly attacked us about in the past. And even the club seems to have learnt from thetransfer sagas last Summer, with the early signing of Podolski andthe moves towards Rennes' midfield stalwart Yann M’Vila signallingArsene's positive intent from the outset. M’Vila in my opinion would be a massive signing. He's a proper defensive midfielder which we just don't have at the moment. Alex Song is a top player and his assist record demonstrates his attacking instinct. M'Vila will help solidify our formation, and allow Song the freedom to attack, and be able to be rested more often. M'Vila can allow Alex Song to provide more cover for the centre backs and can come in when they need a rest. His signing will help the transition from a 4-3-3 to 4-4-2 when needed, and with Podolski in, it is something we may need at the Emirates in particular. It goes without saying that our success next season will depend on keeping our prized asset Robin Van Persie and his good mate Theo Walcott. We all know about Robin but I think Theo is just as important. In simple terms, when Robin Van Persie and Leo Messi say publicly that you’re a good player then you have to start to believe them. Theo has had a good season; he has a game based around speed and in certain games, he just won’t be as effective, and the job for Theo is to have a plan B for these games. At the age of 22/23he has time on his hands to find this plan B and I think he will get there. I have sat in stands with people slating him. I remember one incident at QPR away in particular, when the lady behind me was hurling a torrent of abuse at him, only for him to score, and for her to start cheering him on like there was no tomorrow. With all the talk on Robin, I hope the club are working hard to secure Theo’s future because I believe he will be a vital part of our club for years to come. Another man who has come out and said he feels he has played his part is Yossi Benayoun, and I think he has done much more then that! He has really put in a shift since that Spurs game and since the start of April he has put in some stellar performances. I would love for him to stay but cannot see Chelsea agreeing another year-long loan. And in any case Yossi wants something more permanent, so I expect Sunday will be Yossi’s last game in an Arsenal shirt (I hope he stays though). He has shown heart,commitment and no shortage of skill at the business end of the season. WBA away on Sunday is bigger than a cup final for us. Any Liverpool supporter will tell you how difficult it is to re-enter the Champions League positions after you drop out for a season, and Arsenal's entire fabric would be damaged were we to finish fifth. 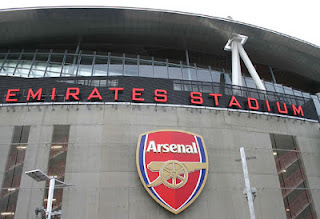 When I was walking back from the Emirates to the Tollington Pub last Saturday, my world was going to end because I thought we had blown it and we would finish behind Spurs and not having our Champions League fate in our own hands. The thought of watching a Champions League final that was going to decide our fate that we were not even playing in was soul-destroying... that was until Aston Villa came to the party and got a result! We have another chance now and we MUST take it. Patrice, retiring after devoting his life to this club, deserves so much credit. He has given everything to our club as player and then as coach and assistant. Thank you Mr Pat Rice. It may have been a testing season on the pitch, but it has been an amazing experience off the pitch. I would like to thank all my Twitter followers, many of whom have become real-life friends I meet at home and away games. The power of Twitter has heightened the pre-and post- match atmosphere at grounds, pubs, trains, service stations and even the streets of North London and the rest of England. So let's get the party started and end the season on a high, and get quality new players in and the current lot signed up, and get prepared to DO SOME DAMAGE NEXT SEASON! As most people were aware, I was given the chance to be on Sky Sports Soccer Saturday a week and a half ago. One line, that I said was not shown on the programme was about how Arsenal CAN beat Spurs and Liverpool and even push for third position in the league. At the time, it looked far away. At the time, we had just got back from Milan and Sunderland and we were fearing that losing the two games would mean the end of the road in terms of getting fourth place. Fast forward a week and a half and people are actually talking about the impossible being...well maybe possible tomorrow night against Milan. Its amazing how quickly things change in football. Do I think we can beat AC Milan tomorrow? Off course I do. Will we do enough to go through? I have no idea; but I would like to see the 11 lads on the pitch give it their best damn shot. If we do it, then great, If we do not but put in a performance then I think we can all be proud. Once again, its amazing how quickly things change in football. People have accused me of ‘only writing when we are winning’ but the truth is, I have written a fair bit over the past few weeks but just have not published it. After coming back from Milan, the positivity had vanished for a few days; the future did not look so bright and serious questions over the clubs future were being asked. One result (one superb result) against Spurs does not make it all okay but it gives the club and supporters a boost. It gives Arsenal a chance. Fourth place is absolutely vital and now people understand that financially not getting to the Champions League would mean the profits announced today would effectively be used to cover the champions’ league failure, it shows the importance of yesterday’s win. The cost of not getting in the Champions League is roughly 45m and that comes from participation in the CL, TV money, commercial deals (a club in the CL will get more then a club not in it), match day revenue (people will not want to pay top prices to watch football on a Thursday night) etc. The Spurs game was epic. Even as an admirer of Arsene Wenger, the mental strength he often talks about is sometimes invisible but yesterday the whole club showed great mental strength. The players fought for every ball and worked so hard. Sagna’s header told me that the players were up for it. Sagna wasn’t afraid to get hit and was fully committed in winning the header and he deserves his goal and even added an assist. Theo Walcott who seemed to get stick from the first minute kept his critics quiet with two superb goals. I have also maintained that along with great pace, I believe he is a good finisher. Finishing does depend on confidence but Theo has the quality in my opinion however, teams are starting to play deeper against him because they fear if he gets behind them, there is no catching him and this means in certain games he will be less effective. At the age of 22, I hope he will develop a plan B to counter this. Rosicky and Yossi were also superb. Rosicky has been very good over the last month and deserved his goal. Yossi kept working and as supporters, that is all we want. 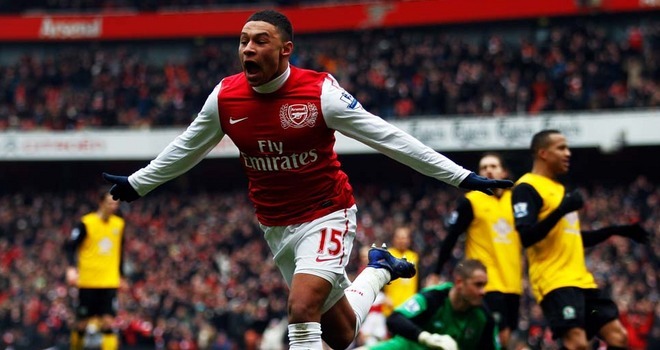 It was a huge call from Mr Wenger to play Yossi ahead of Chamberlain but it worked a treat. Next week at Anfield is a huge game again but hopefully our momentum will continue and we can get the three points there. The fans were superb on Sunday and just kept going even at two down and that sort of support makes the Emirates an amazing place. I am sure the away section at Anfield will be the same as it always is when Arsenal are in town! Up The Arsenal !!!!!! COME ON! Ps. Arsene Wenger’s having a party!! 0-2 down at home to Aston Villa in the FA CUP and I really did fear the worst. Fast forward a week and we came back to beat villa, got a draw away at Bolton and put seven past Blackburn at home. I guess we will really learn what this Arsenal side is about next Saturday when we go to the Stadium Of Light; a win there and maybe a small corner has been turned. Sunderland is a hard place to go specially in recent weeks. The game on Saturday was much needed. The players needed a lift; the manager needed a lift and the fans bloody needed a lift! The reputation of Alex Oxlade-Chamberlain grew further and there are cries of him being included in the England squad for this summer's European championships. 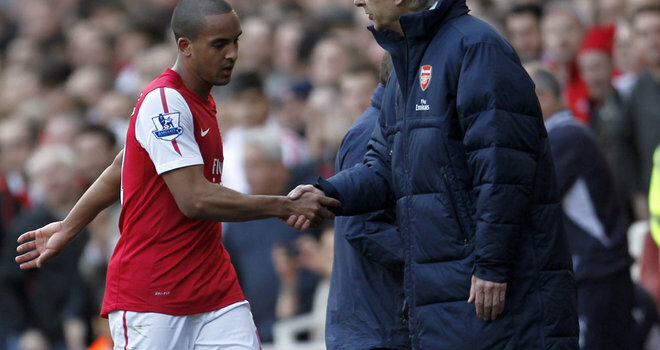 Theo Walcott, who in my opinion is sometimes a bit of a scapegoat had a terrific game with three outstanding assists. Robin Van Persie may have scored three tap ins HOWEVER, the movement he has in the box is something really special. His movement is so intelligent and its not by the luck of god that he is often in the right place at the right time. Now we are off to the Stadium Of Light then off to Milan then possibly back to the Stadium Of Light. Three games, in three competitions.